We want to thank 4-H for continuing their work with our Academy! 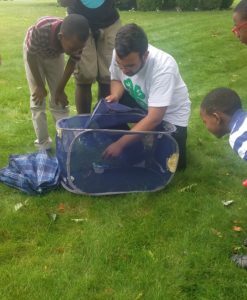 Their summer program involved lessons about nutrition and the environment that truly enlightened and entertained our students. The students learned how to create snacks that are healthy, delicious and easy to make. 4-H ended their program with the release of the butterflies our students studied from the time they were caterpillars. Please make sure to see Nurse Roberts in September to gain information and access to this wonderful program! Award from Councilman Alan Maisel! Congratulations to Paul Terstenyak for winning first place in the Women’s History Poetry Contest! 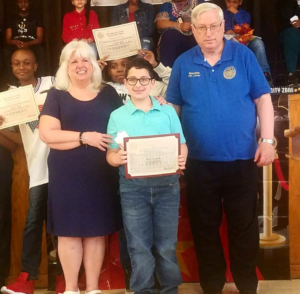 Councilman Alan Maisel came to present Paul & other fifth graders with awards for their participation in the contest. Catch us on Currents News on NET TV tonight! We are very excited to share that Ms. Re, our second grade students, and our academy will be featured on Currents News. The station is doing a segment on Our Lady of Trust Catholic Academy instilling compassion in our students, and they are highlighting Ms. Re’s recent 911 Tribune Award. Currents News is NET TV’s nightly news program featuring local, national and international events and interviews. Launched in 2009, Currents is the first Catholic daily news program in the country. The segment will air tonight at 7:30 p.m. You can watch Currents, on Time Warner Cable Channel 97, Cablevision Channel 30, Verizon Fios Channel 48, and streaming online at netny.tv. If you miss it, we will be receiving a link to put on our website. Congratulations again to Ms. Re and all of our wonderful teachers for empowering our students to be people of love and compassion. Given the impending weather, all afterschool activities are cancelled on Wednesday, March 7th. As of now school is opened, but if anything changes we will notify everyone by 6:00AM. Please check our website in the morning to keep informed. The New York State Legislature has returned from their President’s week break and is moving forward in earnest with state budget negotiations. In addition to considering the tax benefits of the newly expanded 529 plans, lawmakers are also considering whether they can restore the “instructional time” standard in Mandated Services Reimbursement. If we don’t fight to restore this well-established standard, our schools will see a cut in their much needed reimbursement. This link, Take Action for Catholic Schools, brings you to the action alert on the NYS Catholic Conference website. Together as diocese, our collective voice is considerable. Increased state support for our beloved Catholic schools is indeed possible but only if we all Take Action for Catholic Schools. Catholic Schools Week is coming! Due to weather conditions Our Lady of Trust Catholic Academy will be closed Friday, January 5th.